I’m a bit of a pancake fiend, so I’m not easily impressed. But this recipe really got me. 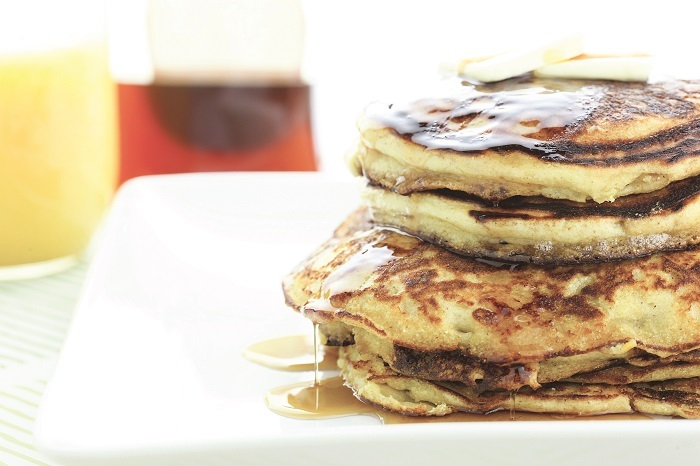 It’s from my cookbook, Eat Green Get Lean, and it’s become one of my “go-to” pancakes. I love the heartiness of the barley flour, the creaminess from the ricotta cheese, and the citrus taste (which doesn’t overpower the dish). The inclusion of protein powder also makes 1 – 2 servings a viable meal! In a large mixing bowl, add the barley, flour, stevia, protein powder, baking powder, and baking soda and mix until well combined. Set aside. In a separate large mixing bowl, add the ricotta, skim milk, orange juice, orange zest, eggs, butter, and vanilla extract. Beat together until mixed well. Slowly mix liquid ingredients into dry ingredients until just mixed. Do not overmix. Coat a large nonstick skillet in cooking spray and wipe away the excess with a paper towel. Save this for wiping the pan after each pancake. Heat the skillet over medium heat. Spoon about 3 to 4 tablespoons of batter onto the griddle and cook until bubbles appear. Flip and cook until golden brown. Repeat step 4 with the remaining batter.